At the beginning of the new year we want to take a look back at the publishers’ performance in Google News in 2016. We will first look at the top players in Google News. After that we will analyse the field in the Google News Boxes for desktop. The third tier will be the analysis of the best publishers in the AMP Carousels. For the grand finale we want to present to you the top 50 Google News topics in 2016 as measured with the News Dashboard. From a position in the midfield Dailymail.co.uk‘s visibility dramatically increases from April 2016 onwards. The first on the podium of the Google News visibility for 2016 is dailymail.co.uk. They put up a steady performance with a visibility around 6 percent until April. After that they skyrocket up to a score of 18.7 percent in December. In January they have 8.320 headlines in Google News, but in December they reach way over 10.000 entries – impressive. Respect for this strong performance in Google News SEO. The runner-up theguardian.com shows us a slightly increased performance this year as they work their way up from January with 7.22 percent visibility up to 9.42 percent in October with a difference of 2.20 percent. Third on the podium is bbc.co.uk with visibility scores around 5 percent until April. But they certainly make up for it in the second half of the year where they verge upon theguardian.com‘s score and nearly reach 10 percent visibility. Telegraph.co.uk is on fourth position and had a great start with a visibility of 9.89 percent in January, however thereupon they never reached that level again and had their lowest score in December with 4.28 percent. Last in the top 5 is independent.co.uk with a reliable performance with a difference in their visibility scores of less than 1 percent. They are between 2.73 percent in June and 3.69 in October and in the last months they drop below mirror.co.uk. 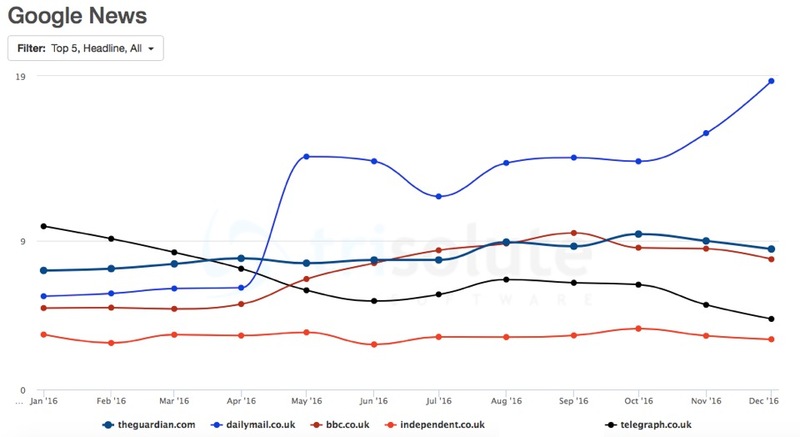 Looking at the desktop Google News Boxes we see the following: bbc.co.uk is on top of the competition with their best score of 34.93 percent in May and they keep up their run and score over 31 percent visibility until October. After that they suffer an extreme hit in winter and descend to a score of a still impressive 21.05 percent in December – a difference of over 10 percent to their starting point. In comparison to the News Box visibilities for desktop in other countries the level of BBC and The Guardian is unusually high. Theguardian.com reaches a top score of 29.67 in September, but is down to 21.42 in December, where they are nevertheless able to beat bbc.co.uk. On overall third position is telegraph.co.uk. While they start and end on fourth position around 12 percent, they are up to 19.53 in September and manage to stay 7 months in a row above dailymail.co.uk. Dailymail.co.uk start with a score of 17.45 in January, although they endure a minor but constant decline up until a score of 13.61 in December, whereas mirror.co.uk‘s score slightly increases over the year from a score of 8.08 in January up to a score of 11.27 in December. Theguardian.com is the clear gold medallist as the AMP Carousels are concerned. As we are able to look at the AMP Carousels visibility from August 2016 onwards, we give a first orientation for the top ranking publishers. As we see, we have a very steady field up to now. The title-holder as the top competitor of 2016 is theguardian.com with their best score of 58.74 percent in September and a lower score at the end of the year of still 50.67 percent in December. Next in line is bbc.co.uk, again with a lightly subsiding curve from 46.27 in January to 38.68 in December 2016. The rest of the field is very tight-knit. We have telegraph.co.uk starting and ending the year around 33 percent visibility. Independent.co.uk is at their best in January with a score of 34.23 percent, but is down to a score of 28.80 in December. 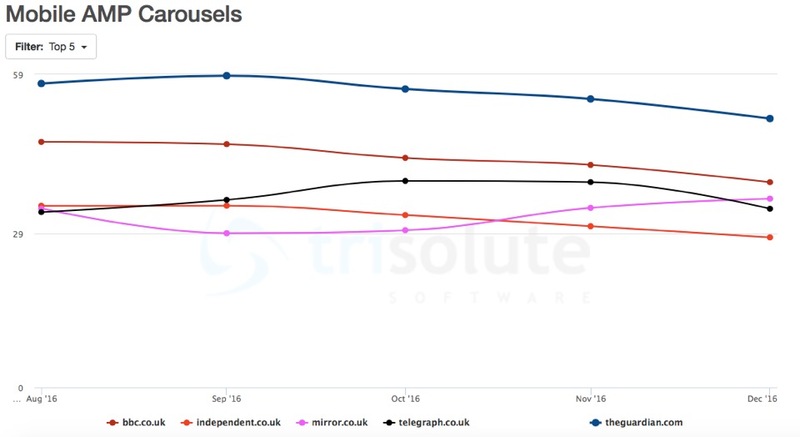 Mirror.co.uk starts right besides telegraph.co.uk and independent.co.uk with a visibility between 33-35 percent, but they overtake the competition with a score of 35.57 in December. Their top 3 keywords from our imported keywords in December are all sports related: manchester united f.c., arsenal f.c. and chelsea f.c.. As the mobile SERP is in permanent movement and there are various elements beside the AMP carousels, it will be interesting to analyse the further development. 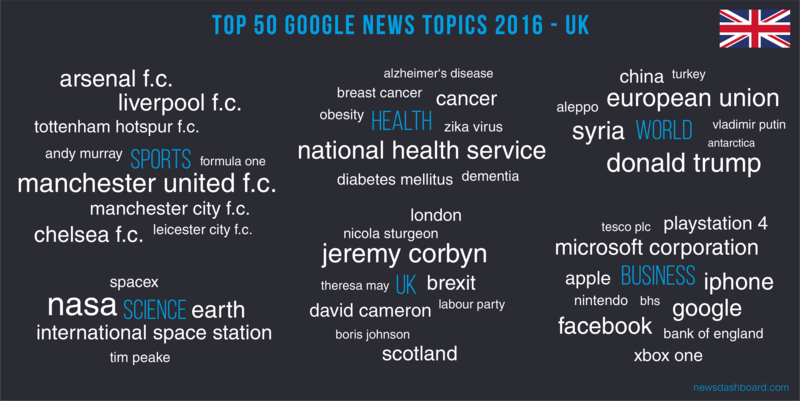 Lastly we have the top 50 Google News topics for 2016 in the UK. For visibility purposes we have put them in a tag cloud. We have looked at the Google News Topics that have been picked up most often by our hourly measurement from Google News throughout the year. The top 5 issues of 2016 in Google News UK are: nasa, manchester united f.c., donald trump, jeremy corbyn and national health service. As we see we have issues from nearly every category on the top level. If you decide to read our other international reviews of 2016, you will see “donald trump” in every top 5 for Google News topics with slightly different positions in the top 5. Bbc.co.uk is a strong publisher overall, but they have lost a bit of their score in Google News Boxes for desktop throughout the year. Theguardian.com beats bbc.co.uk in the AMP Carousels and is also very strong for desktop visibility. Dailymail.co.uk finishes 2016 with an impressive Google News visibility and is still good in the Google News Boxes for desktop, but is not yet strong for mobile visibility. Independent.co.uk and telegraph.co.uk are well rounded players overall, yet there is still some more room for improvement. 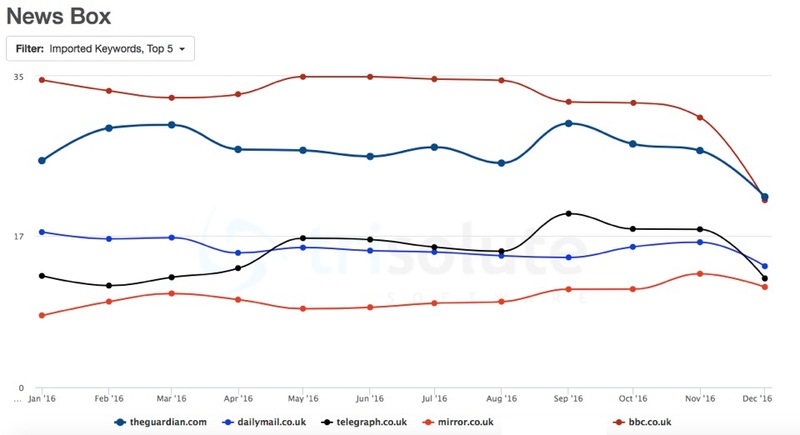 While mirror.co.uk make the top 5 for Google News Boxes for desktop and AMP Carousels, their Google News visibility puts them on positions six to seven.